The need for 'fitting' as-supplied rods to an RTR chassis when converting to P4 wheelsets might seem strange at first, but the unfortunate reality is that the machining of the axle slots in some RTR chassis varies, with the result that the stamped rods do not always match. This problem may or may not be apparent in the out-of-the-box OO state, but if there is a mismatch, a P4 conversion will never run with the desired smoothness unless corrective action is taken. 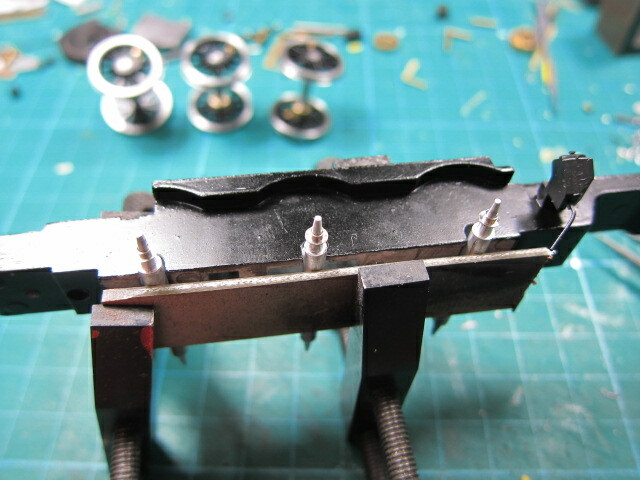 On this page, Tim Venton illustrates an easy way of getting the fit right without altering the chassis block machining. For this method to work well, it is essential for the coupling rod joint to be in good condition, with minimal longitudinal slop. 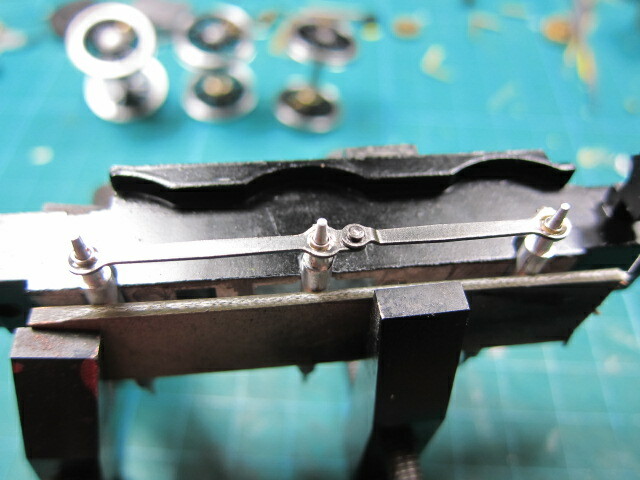 If the rivet joining front and back is a loose fit, a new pivot to hold the rods together will be required. Tapered axle jigs (these are standard 1/8" diameter, but they will sit with good accuracy in nominal 3mm RTR chassis axle slots) are lightly clamped into the chassis axle slots, and the rods are placed over the jigs and examined. In this particular case, there is a large offset on the middle axle crank hole. The offending holes are re-centred by filing. When clamping the axle jigs in, remember you'll need to turn the chassis over and examine the fit of the rods on the other side. 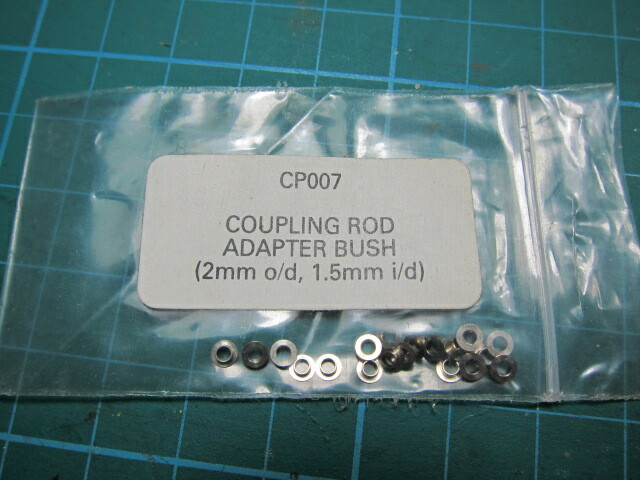 The rod adapter bushes are dropped onto the tapered axle jigs. The rods are dropped onto the bushes, checking that any newly filed holes are now fitting correctly, and soldered to the bushes. 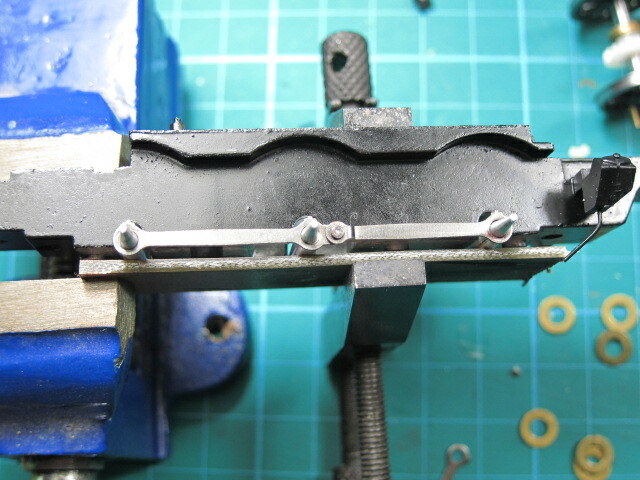 The coupling rod centres now match the chassis block centres.